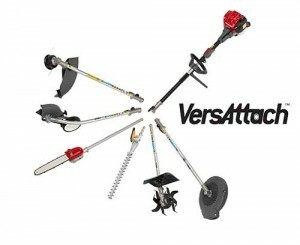 Honda Power Equipment introduced the VersAttach Multi-Purpose System. The VersAttach System offers two powerhead models, the UMC425, powered by a Honda GX25 Mini 4-Stroke engine, and the UMC435, powered by a GX35 Mini 4-Stroke engine. Each model can be paired with an optional interchangeable edger, line trimmer, blower, hedge trimmer, pruner and cultivator that fit into the attachment shaft by way of Honda’s SureLoc joint locking system. Each VersAttach powerhead includes a pair of safety goggles and a single (GX25) or double harness (GX35) for added convenience and control. Both models carry a 36-month residential warranty and a 24-month commercial warranty.